A food pyramid or diet pyramid is a triangular diagram representing the optimal number of servings to be eaten each day from each of the basic food groups. The first pyramid was published in Sweden in 1974. The 1992 pyramid introduced by the United States Department of Agriculture (USDA) was called the "Food Guide Pyramid" or "Eating Right Pyramid". It was updated in 2005 to "MyPyramid", and then it was replaced by "MyPlate" in 2011. Amid high food prices in 1972, Sweden's National Board of Health and Welfare developed the idea of "basic foods" that were both cheap and nutritious, and "supplemental foods" that added nutrition missing from the basic foods. Anna-Britt Agnsäter, chief of the "test kitchen" for Kooperativa Förbundet (a cooperative Swedish retail chain), held a lecture the next year on how to illustrate these food groups. Attendee Fjalar Clemes suggested a triangle displaying basic foods at the base. Agnsäter developed the idea into the first food pyramid, which was introduced to the public in 1974 in KF's Vi magazine. The pyramid was divided into basic foods at the base, including milk, cheese, margarine, bread, cereals and potato; a large section of supplemental vegetables and fruit; and an apex of supplemental meat, fish and egg. The pyramid competed with the National Board's "dietary circle," which KF saw as problematic for resembling a cake divided into seven slices, and for not indicating how much of each food should be eaten. While the Board distanced itself from the pyramid, KF continued to promote it. Food pyramids were developed in other Scandinavian countries, as well as West Germany, Japan and Sri Lanka. 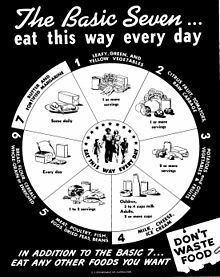 The United States later developed its first food pyramid in 1992. The USDA's original food pyramid, from 1992 to 2005. The USDA's food pyramid from 2005 to 2011, MyPyramid. A modified food pyramid was proposed in 1999 for adults aged over 70. These foods provide complex carbohydrates, which are a good source of energy but provide little nutrition. While they may serve as a filler in low-fat meal plans, replacing these with nuts and seeds would be a better option. Examples include corn, wheat, pasta, and rice. A food pyramid's tip is the smallest part, so the fats and sweets in the top of the Food Pyramid should comprise the smallest percentage of the diet. The foods at the top of the food pyramid should be eaten sparingly because they provide calories, but not much in the way of nutrition. These foods include salad dressings, oils, cream, butter, margarine, sugars, soft drinks, candies, and sweet desserts. Dairy products are produced from the milk of mammals, usually but not exclusively cattle. They include milk, yogurt and cheese. Milk and its derivative products are a rich source of dietary calcium and also provide protein, phosphorus, vitamin A, and vitamin D. However, many dairy products are high in saturated fat and cholesterol compared to vegetables, fruits and whole grains, which is why skimmed products are available as an alternative. Historically, adults were recommended to consume three cups of dairy products per day. More recently, evidence is mounting that dairy products have greater levels of negative effects on health than previously thought and confer fewer benefits. For example, recent research has shown that dairy products are not related to stronger bones or less fractures; on the flip side, another study showed that milk (and yogurt) consumption results in higher bone mineral density in the hip. Overall, the majority of research suggests that dairy has some beneficial effects on bone health, in part because of milk's other nutrients. Certain dietary choices that have been linked to heart disease, such as an 8 oz (230 g) serving of hamburger daily, were technically permitted under the pyramid. The pyramid also lacked differentiation within the protein-rich group ("Meat, Poultry, Fish, Dry Beans, Eggs, and Nuts"). The fats group as a whole have been put at the tip of the pyramid, under the direction to eat as little as possible, which is largely problematic. Under the guide, one would assume to avoid fats and fatty foods, which can lead to health problems. For one, fat is essential in a person's general sustainability. Research suggests that unsaturated fats aid in weight loss, reduce heart disease risk, lower blood sugar, and even lower cholesterol. Also, they are very long sustaining, and help keep blood sugar at a steady level. On top of that, these fats help brain function as well. These controversies prompted the creation of pyramids for specific audiences, particularly the mediterranean pyramid in 1993 and some Vegetarian Diet Pyramids. The Harvard School of Public Health proposes a healthy eating pyramid, which includes calcium and multi-vitamin supplements as well as moderate amounts of alcohol, as an alternative to the Food Guide Pyramid. Many observers[who?] believe that the Harvard pyramid follows the results of nutrition studies published in peer-reviewed scientific journals more closely. But in their book Fantastic Voyage: Live Long Enough to Live Forever, published in 2004, Ray Kurzweil and Terry Grossman M.D., point out that the guidelines provided in the Harvard Pyramid fail to distinguish between healthy and unhealthy oils. In addition, whole-grain foods are given more priority than vegetables, which should not be the case, as vegetables have a lower glycemic load. Other observations are that fish should be given a higher priority due to its high omega-3 content, and that high fat dairy products should be excluded. As an alternative, the authors postulate a new food pyramid, emphasising low glycemic-load vegetables, healthy fats, such as avocados, nuts and seeds, lean animal protein, fish, and extra virgin olive oil. 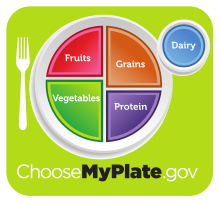 The MyPlate food guide icon. ^ "American Heritage Dictionary Entry: food pyramid". Ahdictionary.com. Archived from the original on 2014-10-25. Retrieved 2015-02-05. ^ a b "Ett provkok blev provkök" (in Swedish). kf.se. 2008-10-03. Archived from the original on 2015-03-09. Retrieved 2011-01-21. ^ a b "KF Provkök lanserar idén om basmat (engl. : KF test-kitchen introduces the idea of foodgroups)" (in Swedish). coop.se. 1973. Archived from the original on 2011-09-29. Retrieved 2011-01-22. ^ a b "matpyramid". Nationalencyklopedin (in Swedish). Archived from the original on 13 December 2010. Retrieved 7 June 2011. ^ "Nutrition Plate Unveiled, Replacing Food Pyramid". The New York Times. 2 June 2011. Archived from the original on 3 June 2011. Retrieved 2 June 2011. ^ "Food-Based Dietary Guidelines in Europe". EUFIC REVIEW 10/2009. www.eufic.org. 2009-10-01. Archived from the original on 2013-01-13. Retrieved 2011-01-26. ^ Melnick, Meredith. "The USDA Ditches the Food Pyramid for a Plate". Time. ISSN 0040-781X. Archived from the original on 2016-07-18. Retrieved 2016-07-26. ^ Russell, Robert M.; Rasmussen, Helen; Lichtenstein, Alice H. (1999). "Modified Food Guide Pyramid for people over seventy years of age". The Journal of Nutrition. 129 (3): 751–753. doi:10.1093/jn/129.3.751. PMID 10082784. ^ Lichtenstein, A. H.; Rasmussen, H; Yu, W. W.; Epstein, S. R.; Russell, R. M. (2008). "Modified My Pyramid for Older Adults". The Journal of Nutrition. 138 (1): 5–11. doi:10.1093/jn/138.1.5. PMID 18156396. ^ "7773-DGA_V7" (PDF). Archived (PDF) from the original on 2009-08-25. Retrieved 2009-09-28. ^ Sahni S, Tucker KL, Kiel DP, Quach L, Casey VA, Hannan MT (24 April 2018). "Milk and yogurt consumption are linked with higher bone mineral density but not with hip fracture: the Framingham Offspring Study". Archives of Osteoporosis. 8 (1–2): 119. doi:10.1007/s11657-013-0119-2. PMC 3641848. PMID 23371478. ^ Office of the Surgeon General (US) (2004). "Bone Health and Osteoporosis: A Report of the Surgeon General". PMID 20945569. ^ Feskanich, D; Willett, W. C.; Colditz, G. A. (2003). "Calcium, vitamin D, milk consumption, and hip fractures: A prospective study among postmenopausal women". The American Journal of Clinical Nutrition. 77 (2): 504–511. doi:10.1093/ajcn/77.2.504. PMID 12540414. ^ "Dietary Guidelines 2005: Two Steps Forward, One Step Back". Harvard School of Public Health. 2012-09-18. Archived from the original on 2015-04-02. Retrieved 2015-04-05. ^ Nestle, M (1993). "Food lobbies, the food pyramid, and U.S. Nutrition policy". International Journal of Health Services. 23 (3): 483–496. doi:10.2190/32f2-2pfb-meg7-8hpu. PMID 8375951. ^ Schlosberg, Suzanna; Neporent, Liz (2005-03-01). Fitness for Dummies. "For Dummies"and you. ^ Burr, George O.; Burr, Mildred M. (1930-04-01). "On The Nature And Rôle Of The Fatty Acids Essential In Nutrition". The Journal of Biological Chemistry. 86 (2): 587–621. Archived from the original on 2009-06-01. Retrieved 2009-09-28. ^ Stoll, A.L. ; Locke, C.A. ; Marangell, L.B. ; Severus, W.E. (1999). "Omega-3 fatty acids and bipolar disorder: A review". Prostaglandins, Leukotrienes and Essential Fatty Acids. 60 (5–6): 329–337. doi:10.1016/S0952-3278(99)80008-8. ^ Simopoulos, Artemis P (1999). "Essential fatty acids in health and chronic disease" (PDF). The American Journal of Clinical Nutrition. 70 (3 Suppl): 560–569. doi:10.1093/ajcn/70.3.560s. PMID 10479232. Archived (PDF) from the original on 2011-06-09. ^ Hu, FB; Manson, JE; Willett, WC (2001). "Types of dietary fat and risk of coronary heart disease: A critical review". Journal of the American College of Nutrition. 20 (1): 5–19. doi:10.1080/07315724.2001.10719008. PMID 11293467. ^ Christine L Pelkman; Valerie K Fishell; Deborah H Maddox; Thomas A Pearson; David T Mauger; Penny M Kris-Etherton (February 2004). "Effects of moderate-fat (from monounsaturated fat) and low-fat weight-loss diets on the serum lipid profile in overweight and obese men and women" (PDF). The American Journal of Clinical Nutrition. 79 (2): 204–212. doi:10.1093/ajcn/79.2.204. PMID 14749224. Archived (PDF) from the original on 2011-07-19. Retrieved 2011-04-18. ^ Hu, Frank B.; Willett, WC (2002). "Optimal Diets for Prevention of Coronary Heart Disease". JAMA. 288 (20): 2569–78. doi:10.1001/jama.288.20.2569. PMID 12444864. ^ Dobbins, RL; Chester, MW; Daniels, MB; McGarry, JD; Stein, DT (1998). "Circulating fatty acids are essential for efficient glucose-stimulated insulin secretion after prolonged fasting in humans". Diabetes. 47 (10): 1613–8. doi:10.2337/diabetes.47.10.1613. PMID 9753300. ^ Ruderman, Neil B.; Toews, CJ; Shafrir, E (1969). "Role of Free Fatty Acids in Glucose Homeostasis". Archives of Internal Medicine. 123 (3): 299–313. doi:10.1001/archinte.1969.00300130081012. PMID 4303992. ^ Toft, Ingrid (1995-12-15). "Effects of n-3 Polyunsaturated Fatty Acids on Glucose Homeostasis and Blood Pressure in Essential Hypertension: A Randomized, Controlled Trial". Annals of Internal Medicine. 123 (12): 911–8. doi:10.7326/0003-4819-123-12-199512150-00003. PMID 7486485. Archived from the original on 2009-07-23. ^ McCann, JC; Ames, BN (2005). "Is docosahexaenoic acid, an n-3 long-chain polyunsaturated fatty acid, required for development of normal brain function? An overview of evidence from cognitive and behavioral tests in humans and animals". The American Journal of Clinical Nutrition. 82 (2): 281–95. doi:10.1093/ajcn.82.2.281. PMID 16087970. ^ Reyes, Raphael (2008-07-15). "Food Pyramid Frenzy: Lobbyists Fight to Defend Sugar, Potatoes and Bread In Recommended U.S. Diet". Wall Street Journal. Retrieved 2006-12-09. ^ António José Marques da Silva (2015). La diète méditerranéenne. Discours et pratiques alimentaires en Méditerranée (vol. 2). Paris: L'Harmattan. pp. 49–51. ISBN 978-2-343-06151-1. Archived from the original on 2015-09-08. ^ Haddad, Ella (1994). "Development of a vegetarian food guide" (PDF). The American Journal of Clinical Nutrition. 59 (52(suppl)): 1248S–1254S. doi:10.1093/ajcn/59.5.1248S. PMID 8172130. Retrieved 2011-06-20. ^ Venti, Carol; Johnston, CS (2002). "Modified Food Guide Pyramid for Lactovegetarians and Vegans" (PDF). The Journal of Nutrition. 132 (5): 1050–1054. doi:10.1093/jn/132.5.1050. PMID 11983836. Archived from the original on 2014-08-16. Retrieved 2011-06-20. ^ Messina, Virginia; Melina, V; Mangels, AR (2007). "A New Food Guide: For North American Vegetarians". Canadian Journal of Dietetic Practice and Research. 64 (2): 82–86. CiteSeerX 10.1.1.602.3760. doi:10.3148/64.2.2003.82. PMID 12826029. Archived from the original on 2016-05-08.